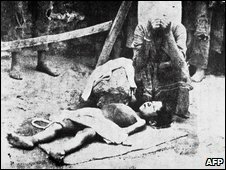 A US congressional panel has described the killing of Armenians by Turkish forces during World War I as genocide, despite White House objections. The resolution was narrowly approved by the House Foreign Affairs Committee. Turkey, a key US ally, responded by recalling its ambassador in Washington for consultations. It has fiercely opposed the non-binding resolution. 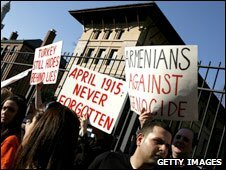 The White House had warned that the vote would harm reconciliation talks between Turkey and Armenia. The resolution calls on President Barack Obama to ensure that US foreign policy reflects an understanding of the "genocide" and to label the World War I killings as such in his annual statement on the issue. It was approved by 23 votes to 22 by the committee. Ankara has already withdrawn its ambassador from Washington for consultations - in reaction to what will be seen as a significant international insult. Washington will now be working hard to limit any further diplomatic fallout. As one of the United States' most important allies in the Muslim world, Turkey's influence is important on both Iran and Afghanistan. And the cheapest and safest way of extracting American soldiers from Iraq next year would be from neighbouring Turkey - if the diplomatic atmosphere permits. Within minutes the Turkish government issued a statement condemning "this resolution which accuses the Turkish nation of a crime it has not committed". The statement also said the Turkish ambassador was being recalled for consultations. During his election campaign Mr Obama promised to brand the mass killings genocide. Before the vote, committee chairman Howard Berman urged fellow members of the committee to endorse the resolution.